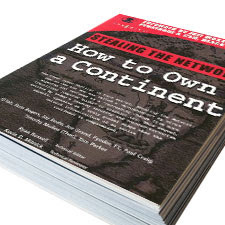 I've just finished reading the copy of Stealing The Network: How To Own A Continent that I borrowed from a friend. I thoroughly enjoyed it and am looking forward to my copy of How To Own The Box arriving even more. The storyline is excellent with enough technical description to keep it interesting, but not so much that it gets tedious. There are some very interesting ideas here and I would definitely recommend this book to anyone with an interest, professional or otherwise, in hacking and information security. There are very few people around who would learn nothing from reading this. The story is broken up into 8 different attack types, with a couple of extra chapters of background information. Each chapter deals with a different attack and introduces a different character, some of whom are criminals and some are people duped into co-operation, and each chapter is written by a different figure within the security community. There are some links and references between the chapters, but they are, for the most part, pretty self contained. My favourite chapters were the ones written by Fyodor and Jay Beale. As I already said, I really enjoyed this, and will be making an effort to read the rest of the series.